Typically, residential pools are boring simple box of water affairs. 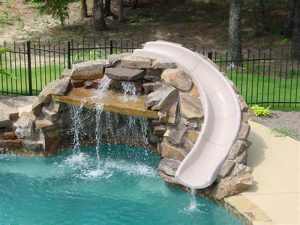 Ever since time immemorial, pools have been home improvements that are nice to think about but are usually rarely used after a while. Well, this is probably because most pool designs are boring, unimaginative and gets tired quickly. In order to get the most out of your investment in building a pool, you should do it right and you should do it beautifully. With the coming of the widespread use of tempered glass, building a pool that is a stunning piece of art is no longer a pipe dream. By using a frameless pool fence and glass pool walls you can design a beautiful yet still fully functional pool for your home. Using a glass pool fence will give you the same security and safety as other types of pool fences; with the added benefit of creating a sense of space and unrestricted movement for you, your family and your guests. Adding glass pool walls, meanwhile, will let you see what is going on underwater from the poolside lounge which is quite stunning and will make for a good conversation piece during social gatherings. A glass pool wall can also be matched with tastefully done lighting to make stunning pool effects that will truly make your home unforgettable and one of a kind.